"Cut The Rope" and "Pudding Monsters": NEW Web version of "Cut The Rope"
NEW Web version of "Cut The Rope"
You need a new browser which supports HTML5 to play the game, like Microsoft Internet Explorer 9, Google Chrome or Apple Safari. When I tried with IE8 and an older version of Mozilla Firefox, a message appeared asking me to use a newer browser, and it recommended that I used the latest version of IE. 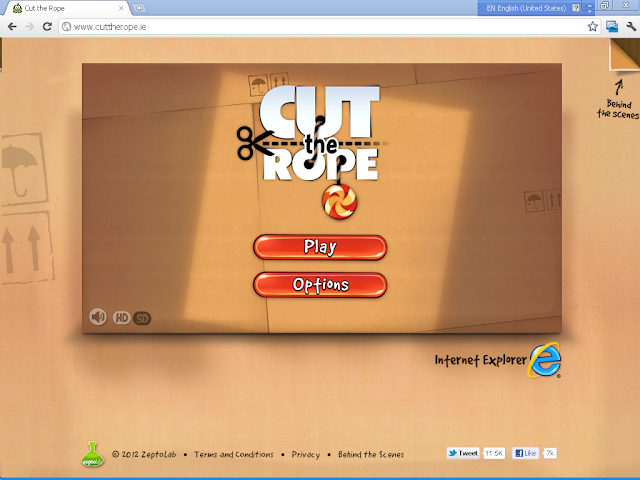 The advantage of using IE9 over the other browsers is that you can play 7 EXTRA levels by pinning the game to the Windows 7 task bar to unlock the levels. 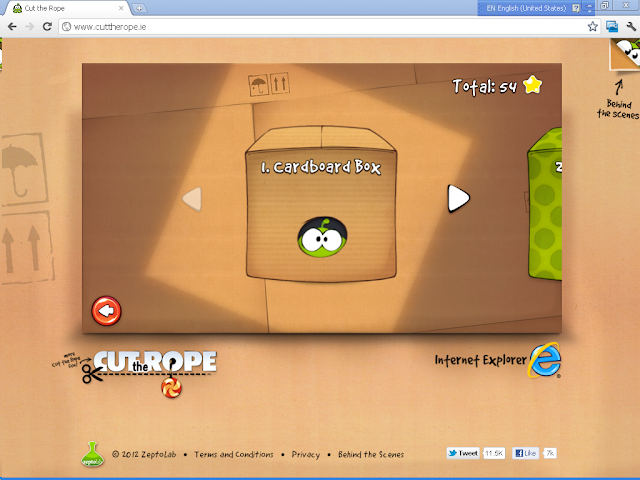 Currently there're only 18 levels (7 more when using IE9) in this web version, 9 for "Cardboard Box" and 9 for "Fabric Box". 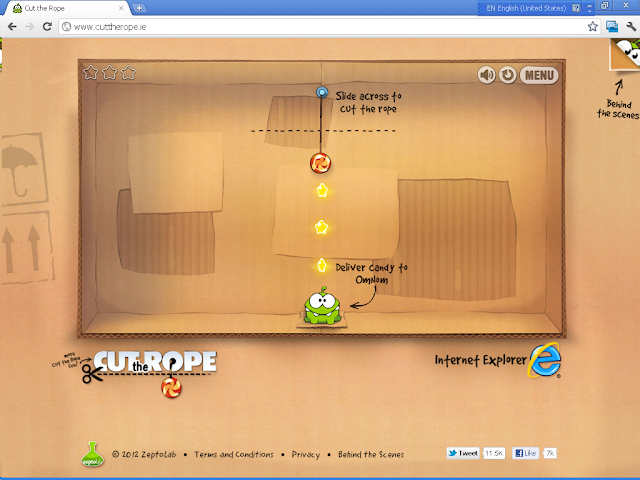 It's similar to "Cut The Rope Lite" (renamed as "Cut The Rope Free" starting from ver. 1.3) for the iOS devices but a few levels are different, and the gameplay is a bit different when using the mouse. There's no leaderboard by the way but you can see the score after playing. I think they may add more boxes and levels in future, or they're creating this free web version so that more people can try out this game before deciding on buying the full version. There are a few tricks I wasn't able to trigger like the faster strat on #7. The gameplay for this web version (using mouse) is different from the iOS versions (using multi-touch). On some older Google Android devices, you can't perform multi-touch (some users complained about it in the Amazon.com app store). I noticed the differences also but since there's no leaderboard for this web version, the scores are not important so I didn't mention about it.